Wall paintings have been cultural expressions of human creation throughout history, from the earliest beginnings, such as rock art, extending up to present day murals. Their deterioration, accidental or intentional destruction constitutes a loss affecting a significant part of the world’s cultural heritage. Preface: The ICOMOS Principles for the preservation and conservation/restoration of wall paintings (2003) was adopted by the ICOMOS 14th General Assembly in Victoria Falls, Zimbabwe, in 2003 . Wall paintings represent a significant part of a culture’s aesthetic freedoms, whilst also serving as a reminder of the diversity of materials and technology available in its time. This article presents the principles set out by ICOMOS at the Assembly in 2003, with its main focus on the conservation-restoration treatments. It presents the aims of restoration, the implementation of various bodies of knowledge in each stage of the treatment and the contribution of relevant authorities. Also included are the policies and laws to prohibit and protect the alteration of wall paintings, scholarly conventions to investigate the historic, aesthetic and technical dimensions, analytical documentation methods, appropriate monitoring, maintenance, and damage prevention, dissemination of knowledge and the specialized training required to work with heritage preservation. The richness of wall paintings is founded on the variety of cultural expressions, aesthetic achievements, and the diversity of materials and techniques used from ancient until present times. Composite materials in many historic buildings need special consideration outside the scope of this document. Architectural surfaces and their finishing layers, with their historical, aesthetic and technical values have to be considered as equally important components of historic monuments. The principles was drafted in Copenhagen from 28th October 28 to 1 November 2002. It was edited and completed in Thessaloniki from 8 to 9 May 2003. 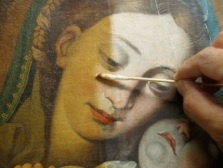 It provides more specific principles for the protection, preservation and the conservation-restoration of wall paintings. It reflects basic and universally applicable principles and practices, and does not take into account particular problems of regions or countries, which can be supplemented at regional and national level by providing further recommendations where necessary.